A few years ago in one of these pieces I exhorted you to visit the Villa Romana del Casale in the middle of Sicily. What? You still haven’t been?! Shame on you!! It’s even more of a good idea now than it was then. As we explained in Molecular Mosaics, the villa houses the most extensive set of mosaics anywhere in the world and we were prompted to draw a parallel between their complexity and that of cancer by one of several pieces of research that took small bits of primary and secondary tumours, hit them with the power of DNA sequencing and showed that every region was different. It’s turned out that each individual tumour cell has sequence differences from even its nearest neighbours. So if you look at DNA sequence in cells across a tumour it would indeed be a mosaic. Wonderful though DNA is, whilst it contains all the information required for life it doesn’t show you how to use it. It’s a bit like an architect’s plan for a new building: immensely detailed as to shape, where the doors and windows are etc., but with no information about the different bits — which is steel or glass, concrete or wood — yet alone how they’re put together to make the final edifice. DNA is indeed a ‘blueprint’ as it’s so often described but to find out how cells behave we need to know which proteins are being produced at any time by the machinery of the cell as it translates the sequence of DNA bases (A, C, G & T) into the molecules that actually make things happen. 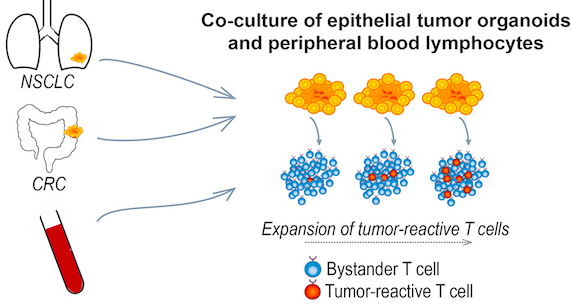 Killer T cells in action. 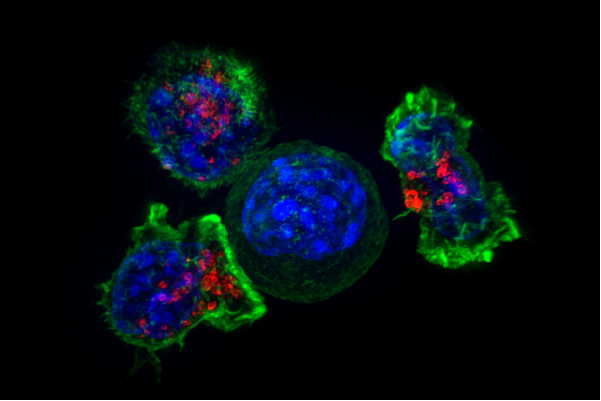 The image shows a group of killer T cells (a sub-group of lymphocytes that destroy target cells identified as abnormal, including virus-infected cells and tumour cells) surrounding a cancer cell. DNA is stained blue. The T cells are green (via an antibody that attaches to a surface protein (CD8) that defines this type of cell) and red (small sacs within the cells that deliver ‘the kiss of death’ to kill the cancer cell). That’s OK for one type of cell but how can you look at a piece of tissue and ask: “What is the range of cell types present?” That’s the question Leeat Keren, Michael Angelo and colleagues at Stanford University posed in the context of breast tumours and the stunning answers are to be found in their recent paper in the journal Cell. The methods they used are formidable but, armed with what we’ve just said about detecting one type of lymphocyte (killer T cells), we can break them down into simple steps from which emerge astonishingly complex patterns. They used a panel of antibodies that could pick out 36 different cell types and added them to slices of tumours. Rather than using fluorescent labels their antibodies carried ‘mass tags’. When a beam of charged particles is fired at the sample (so that it rasters across the target) cells are nebulized into single-cell droplets. The location of fragments released carrying the tags can be pinpointed and they are analysed by mass spectrometry to identify the antibody. From this comes an image of protein expression (i.e. cell type), each being given a false colour (or pseudo colour) to show up the distribution. 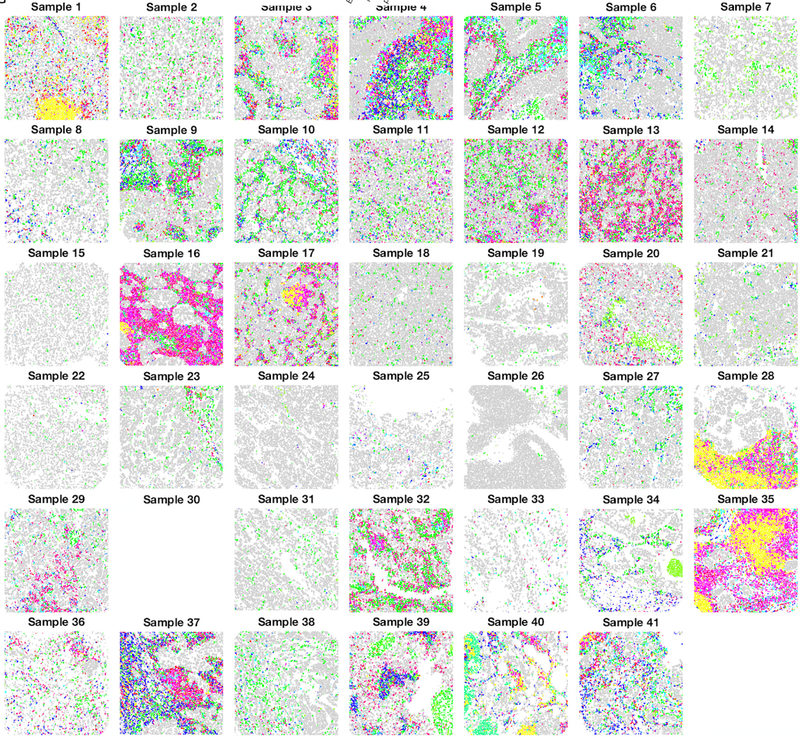 Cellular architecture of tumour samples. Each panel is a section of a breast tumour: each is from a different patient. Individual cell types picked out as described above. From Keren et al. 2018. You might think this is just the tile pattern you’ve been after for your kitchen — not least because the most striking feature is that no two pieces are the same. The biology behind this variation is that across patients there were large differences in both the variety (type) and number of immune cells, notwithstanding the fact that all had the same type of tumour — triple-negative breast cancer. However, even from this extraordinary variation it was possible to tease out some trends. Thus, for example, some tumours had high numbers of macrophages (25%) but low numbers of killer cells (1%), with B cells (11%), CD4+ (15%), CD8+ (19%) and regulatory T cells (1%) falling in between. An important point is that these trends relate to patient survival. 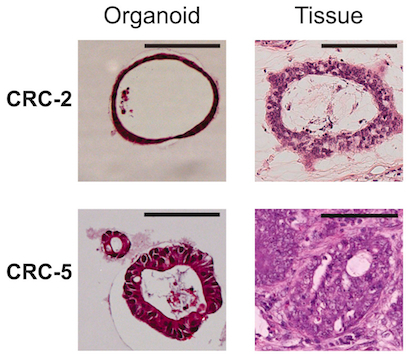 The variation in patterns also hints at how different cells of the immune system are drawn to the site of a tumour and hence how they might cooperate in mounting a defence against cancer progression. Another notable finding was that proteins known to be important in controlling the immune response (e.g., PD-L1) can appear in different cell types. For example, in tumour cells themselves in some patients but in immune cells in others. It’s amazing science, complete with pretty pictures — but it should help in categorizing patients and in the rational design of therapies. Keren, L. et al. (2018). A Structured Tumor-Immune Microenvironment in Triple Negative Breast Cancer Revealed by Multiplexed Ion Beam Imaging. Cell 174, P1373-P1387.E19. In the previous blog I talked about Breath Biopsy — a new method that aims to detect cancers from breath samples. I noted that it could end up complementing liquid biopsies — samples of tumour cell DNA pulled out of a teaspoon of blood — both being, as near as makes no difference, non-invasive tests. Just to show that there’s no limit to the ingenuity of scientists, yet another approach to the detection problem has just been published — this from Matt Trau and his wonderful team at The University of Queensland. This new method, like the liquid biopsy, detects DNA but, rather than the sequence of bases, it identifies an epigenetic profile — that is, the pattern of chemical tags (methyl groups) attached to bases. As we noted in Cancer GPS? cancer cells often have abnormal DNA methylation patterns — excess methylation (hypermethylation) in some regions, reduced methylation in others. Methylation acts as a kind of ‘fine tuner’, regulating whether genes are switched on or off. In the methylation landscape of cancer cells there is an overall loss of methylation but there’s an increase in regions that regulate the expression of critical genes. This shows up as clusters of methylated cytosine bases. Rather helpfully, a little while ago in Desperately SEEKing … we talked about epigenetics and included a scheme showing how differences in methylation clusters can identify normal cells and a variety of cancers and how these were analysed in the computer program CancerLocator. The Trau paper has an even better scheme showing how the patterns of DNA decoration differ between normal and cancer cells and how this ‘methylscape’ (methylation landscape) affects the physical behaviour of DNA. How epigenetic changes affect DNA. Scheme shows methylation (left: addition of a methyl group to a cytosine base in DNA) in the process of epigenetic reprogramming in cancer cells. This change in the methylation landscape affects the solubility of DNA and its adsorption by gold (from Sina et al. 2018). Critically, normal and cancer epigenomes differ in stickiness — affinity — for metal surfaces, in particular for gold. In a clever ploy this work incorporated a colour change as indicator. We don’t need to bother with the details — and the result is easy to describe. DNA, extracted from a small blood sample, is added to water containing tiny gold nanoparticles. The colour indicator makes the water pink. If the DNA is from cancer cells the water retains its original colour. If it’s normal DNA from healthy cells the different binding properties turns the water blue. By this test the Brisbane group have been able to identify DNA from breast, prostate and colorectal cancers as well as from lymphomas. So effective is this method that it can detect circulating free DNA from tumour cells within 10 minutes of taking a blood sample. The aim of the game — and the reason why so much effort is being expended — is to detect cancers much earlier than current methods (mammography, etc.) can manage. The idea is that if we can do this not weeks or months but perhaps years earlier, at that stage cancers may be much more susceptible to drug treatments. Trau’s paper notes that their test is sensitive enough to detect very low levels of cancer DNA — not the same thing as early detection but suggestive none the less. 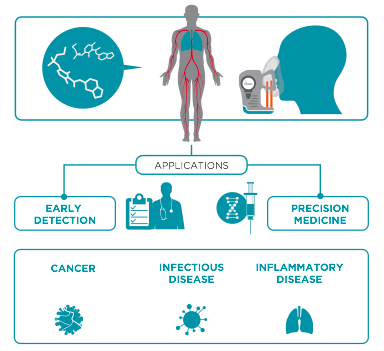 So there are now at least three non-invasive tests for cancer: liquid biopsy, Breath Biopsy and the Queensland group’s Methylscape, and in the context of epigenetics we should also bear in mind the CancerLocator analysis programme. Matt Trau acknowledges, speaking of Methylscape, that “We certainly don’t know yet whether it’s the holy grail for all cancer diagnostics, but it looks really interesting as an incredibly simple universal marker for cancer …” We know already that liquid biopsies can give useful information about patient response to treatment but it will be a while before we can determine how far back any of these methods can push the detection frontier. In the meantime it would be surprising if these tests were not being applied to age-grouped sets of normal individuals — because one would expect the frequency of cancer indication to be lower in younger people. From a scientific point of view it would be exciting if a significant proportion of ‘positives’ was detected in, say, 20 to 30 year olds. Such a result would, however, raise some very tricky questions in terms of what, at the moment, should be done with those findings. Abu Ali Ibn Sina, Laura G. Carrascosa, Ziyu Liang, Yadveer S. Grewal, Andri Wardiana, Muhammad J. A. Shiddiky, Robert A. Gardiner, Hemamali Samaratunga, Maher K. Gandhi, Rodney J. Scott, Darren Korbie & Matt Trau (2018). Epigenetically reprogrammed methylation landscape drives the DNA self-assembly and serves as a universal cancer biomarker. Nature Communications 9, Article number: 4915. Alexander Porfiryevich Borodin is a name that will perhaps be familiar only to musical folk of a fairly dedicated kind. Which is a shame because he wrote some wonderful music particularly in his symphonies, in the magical portrait of the steppes of Central Asia and in his opera Prince Igor, albeit not finishing the latter. But Borodin was more than just a gifted composer for he started life as an illegitimate child, qualified as a doctor in Saint Petersburg and became a Professor of Chemistry at the Imperial Medical-Surgical Academy in that city. He carried out some very significant chemical research – he’s even got a reaction named after him – whilst, as a hobby, becoming a sufficiently outstanding composer to be one of The Mighty Handful. Along the way he founded the School of Medicine for Women in Saint Petersburg, the first Russian medical institute for women. With that background we can be sure that Borodin would have been thrilled to note the recent headlines about the trial of a breathalyser test for cancers. It’s being run by my colleague Rebecca Fitzgerald of the Cancer Research UK Cambridge Centre (and of tea bag fame: see Open Wide for Pasty’s Throat), initially for people suspected to have oesophageal or stomach cancers but in time to be extended to other cancers. What would have excited the chemist in Borodin is that the test collects airborne molecules from the breath and uses the most advanced modern chemistry to analyse them (the details don’t matter but, for the record, the critical method is called Field Asymmetric Ion Mobility Spectroscopy (FAIMS) which distinguishes molecules by how fast they move when driven through a gas by an electric field). At first pass it may sound fanciful to think of detecting cancer on the breath but perhaps it shouldn’t. After all, we’re familiar with breathalysers that detect alcohol levels and, more generally, we all know that ‘bad breath’ isn’t a good sign. For example, the smell of acetone on the breath can arise from type I diabetes, when the body increases its use of fat due to low insulin levels. My old chemistry teacher was known throughout the school as ‘Fruity’ — the word he used with relish to describe the scent of ketones (acetone is the smallest member of the ketones). 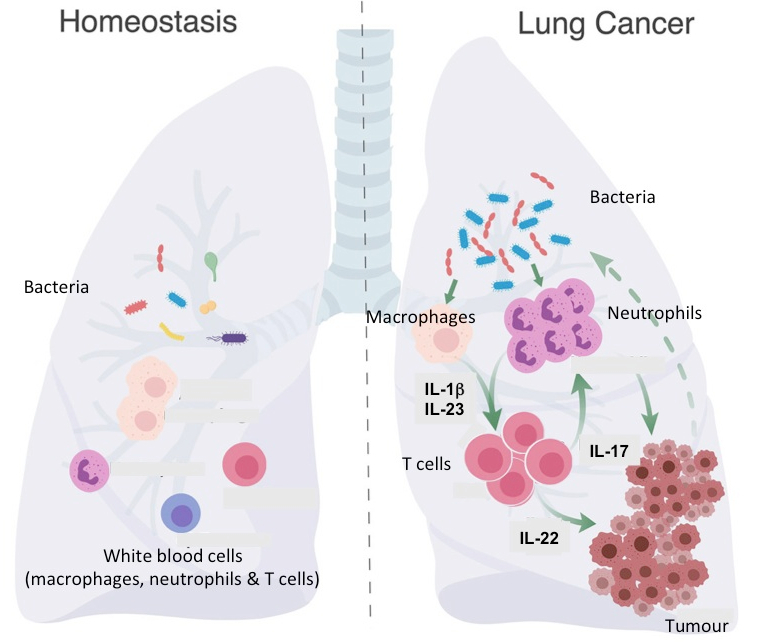 The general point is that molecules released from cells can find their way into the lungs and emerge in the breath and now they can be identifed to find signatures indicative of disease. The detection of breath-born chemicals can inform diagnosis and treatment of disease. From ebook “Breath Biopsy: The Complete Guide” by Owlstone Medical Ltd. Pioneering this approach is a company called Owlstone Medical whose Breath Biopsy analytical platform carries out the spectroscopy of airborne molecules (volatile organic compounds). The idea is that someone exhales into a mask and chemicals born on the breath are collected by a cartridge for subsequent analysis. More than 1000 different compounds can be identified by this state-of-the-art technology and for cancer detection these may include substances released by tumour cells and also those emanating from host cells that have been drawn into the tumour microenvironment. Followers of this blog will know of my enthusiasm for cancer early detection, in particular the liquid biopsy method that permits the isolation of tumour DNA from small blood samples. The breathalyzer system is a different approach to the same problem — and it may be that, in the end, both will have useful roles to play. I should add that my publicizing Owlstone Medical is entirely on account of the apparent potential of their system for cancer screening. Although the company is based in Cambridge, I have no connection with them. I rather wish I had. If Borodin was here to comment he might wryly observe that in his opera the breaths launched by the enslaved captives when they start to sing ‘Born on wings …’ carried only grief and sorrow but with Breath Biopsy it may be that bad news enwraps good — if it carries a warning of cancers or other diseases sufficiently early that they may be stopped in their tracks. I guess most of us at some time or other will have stood gazing at a painting for a while before muttering ‘Wow, that’s awesome’ or words to that effect if we’re not into the modern argot. Some combination of subject, style and colour has turned our crank and left us thinking we wouldn’t mind having that on our kitchen wall. Given the thousands of years of man’s daubing and the zillions of forms that have appeared from pre-historic cave paintings through Eastern painting, the Italian Renaissance, Impressionism, Dadaism and the rest to Pop Art, it’s amazing that everyone isn’t a fanatic for one sort or another. The sane might say the field’s given itself a bad name by passing off tins of baked beans, stuff thrown at a canvas and unmade beds as ‘art’ but, even so, it seems odd that it remains a minority obsession. Science is wonderful, as we all know, but the notion that it might arouse the collective artistic lust seems fanciful. Nevertheless, unnoticed by practically everyone, our vast smorgasbord of smears has been surreptitiously joined over the last 30 years by a new form: an ever-expanding avalanche of pics created by biologists trying to pin down how animals work at the molecular level. The crucial technical development has been the application of fluorescence in the life sciences: flags that glow when you shine light on them and can be stuck on to molecules to track what goes on in cells and tissues. The pioneer of this field was Roger Tsien who died, aged 64, in 2016. Because this has totally transformed cell biology we’ve run into lots of brilliant examples in these pages — recently in Shifting the Genetic Furniture, in Caveat Emptor and John Sulston: Biologist, Geneticist and Guardian of our Heritage and in the use of red and green tags for picking out individual types of proteins that mark mini-cells within cells in Lorenzo’s Oil for Nervous Breakdowns. To mark the New Year this piece looks at science from a different angle by focussing not on the scientific story but on the beauty that has become a by-product of this pursuit of knowledge. So let’s take a stroll through our science gallery and gaze at just a few, randomly selected works of art. This was one of the first experiments in my laboratory using fluorescently labelled antibodies, carried out by a student, Emily Hayes, so long ago that she now has a Ph.D., a husband and two children. The cells are endothelial cells (that line blood vessels). Blue: nuclei; green: F-actin; red: Von Willebrand factor, a protein marker for endothelium. One of my fondest memories is helping to do the first experiment that measured the level of calcium within a cell, carried out with my colleague the late Roger Tsien and two other friends. I only grew the cells: Roger had designed and made the molecule, quin2. We didn’t know it at the time but Roger’s wonder molecule was the first of many intracellular ‘reporters.’ Roger shared the 2008 Nobel Prize in Chemistry for his discovery and development of the green fluorescent protein with organic chemist Osamu Shimomura and neurobiologist Martin Chalfie. This wonderful video of a descendant of quin2 in nerve cells was made in Dr. Sakaguchi’s lab at Iowa State University. Click for a time-lapse movie of an egg cell that has been artificially stimulated to show the kind of calcium change that happens at fertilization. In this time-lapse movie the calcium level reaches a maximum signal intensity after about 30 min before gradually decreasing to the basal level. This movie shows how protein filaments in cells can continuously break down and reform – called treadmilling. Visualised in HeLa cells using a green fluorescent protein that sticks to microtubules (tubular polymers made up of the protein tubulin) by HAMAMATSU PHOTONICS. This movie shows how mitochondria (organelles within the cell) are continuously changing shape and moving within the cell’s interior (cytosol). Red marks the mitochondria; green DNA within the nucleus. HAMAMATSU PHOTONICS. Pig kidney cells undergoing mitosis. Red marks DNA (nucleus); green is tubulin: HAMAMATSU PHOTONICS. 8. DNA portrait of Sir John Sulston by Marc Quinn commissioned by the National Portrait Gallery: This image looks a bit drab in the present context but in some ways it’s the most dramatic of all. John Sulston shared the 2002 Nobel Prize in Physiology or Medicine with Sydney Brenner and Robert Horvitz for working out the cell lineage of the roundworm Caenorhabditis elegans (i.e. how it develops from a single, fertilized egg to an adult). He went on to sequence the entire DNA of C. elegans. Published in 1998, it was the first complete genome sequence of an animal — an important proof-of-principle for the Human Genome Project that followed and for which Sulston directed the British contribution at the Sanger Centre in Cambridgeshire, England. The project was completed in 2003. 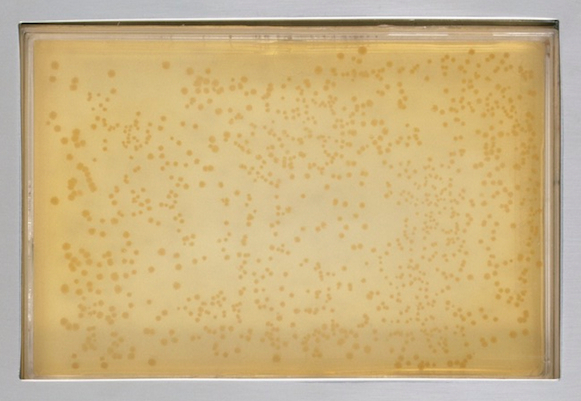 The portrait shows colonies of bacteria in a jelly that, together, carry all Sulston’s DNA. This represents DNA cloning in which DNA fragments, taken up by bacteria after insertion into a circular piece of DNA (a plasmid), are multiplied to give many identical copies for sequencing. 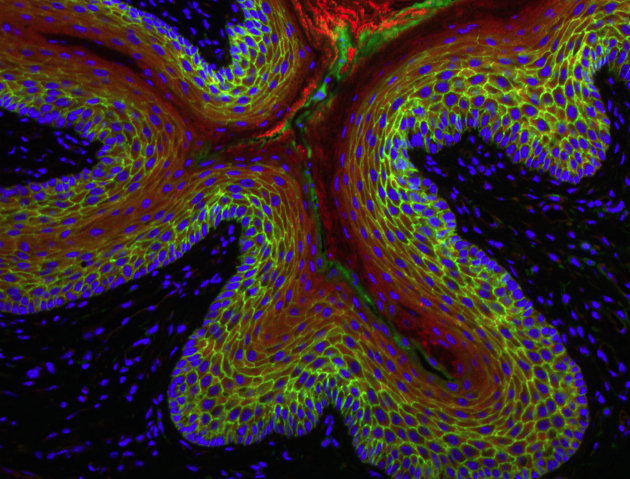 The science behind this astonishing image builds on the work of Roger Tsien. Mice are genetically engineered to carry three different fluorescent proteins corresponding to the primary colours red, yellow and blue. Within each cell recombination occurs randomly, giving rise to different colours. The principle of mixing primary colours is the same as used in colour televisions. In this view individual neurons in the brain (specifically a layer of the hippocampus) project their dendrites into the outer layer. Other magnificent pictures can be seen in the Cell Picture Show. It’s certainly science – but is it art? A few years ago the Fitzwilliam Museum in Cambridge staged Vermeer’s Women, an exhibition of key works by Johannes Vermeer and over thirty other masterpieces from the Dutch ‘Golden Age’. I tried the experiment of standing in the middle of each room and picking out the one painting that, from a distance, most caught my amateur eye. Funny thing was: not one turned out to be by the eponymous star of the show! Wondrous though Vermeer’s paintings were, the ones that really took my fancy were by Pieter de Hooch, Samuel van Hoogstraten and Nicolaes Maes, guys I’d never heard of. Which made the point that you don’t need to be a big cheese to make a splash and that in the new Dutch Republic of the 17th century, the most prosperous nation in Europe, there was enough money to keep a small army of splodgers in palettes and paint. Skillful and incredibly patient though these chaps were, they simply used the tools available to paint what they saw in the world before them — as for the most part have artists down the ages. But hang on! Isn’t that what we’ve just been on about? Scientists applying enormous skill and patience in using the tools they’ve developed to visualize life — to image what Nature lays before them. So the only difference between the considerable army of biological scientists around the world making a new art form and the Old Masters is that the newcomers are unveiling life — as opposed to the immortalizing a rather dopy-looking aristocrat learning to play the virginal or some-such. Not really. Let’s leave the last word to Roger Tsien. 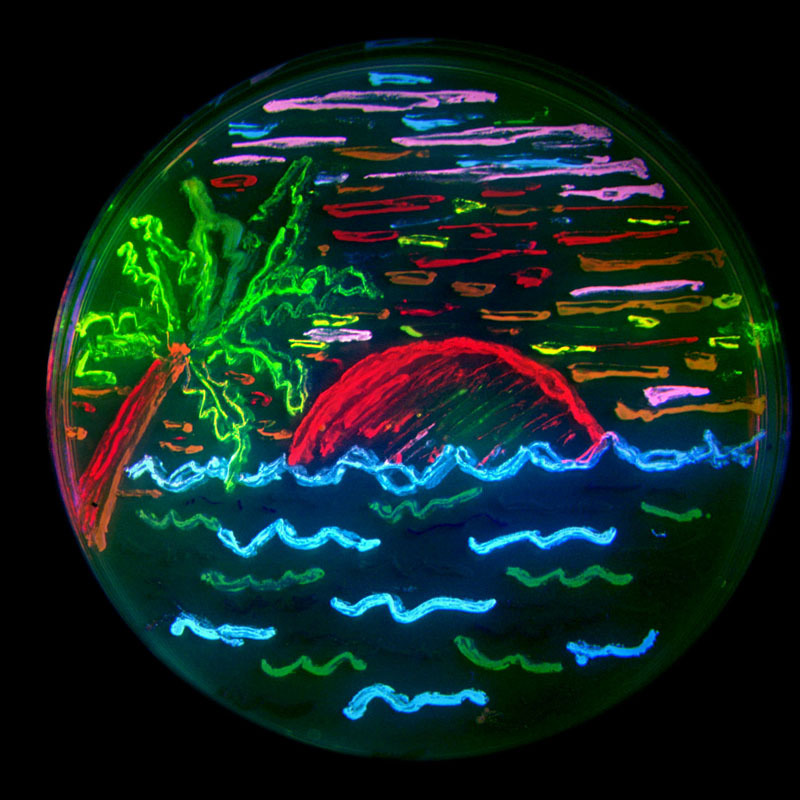 In our final picture there are eight bacterial colonies each expressing a different colour of fluorescent protein arranged to grow as a San Diego beach scene in a Petri dish. It became the logo of Roger’s laboratory. Readers of these pages will know very well that cells are packets of magic. Of course, we often describe them in the simplest terms: ‘Sacs of gooey stuff with lots of molecules floating around.’ And it’s true that we know a lot about the protein pathways that capture energy from the food we eat and about the machinery that duplicates genetic material, makes new proteins and sustains life. Even so, although we’ve worked out much molecular detail, we have scarcely a clue about how ‘stuff’ in cells is organised. How do the tens of thousands of different types of proteins find their places in the seemingly chaotic jumble of a cell so that they can do their job? If that remains a mystery there’s an even more perplexing one in the form of the nucleus. That’s a smaller sac (i.e. a compartment surrounded by a membrane) that is home to most of our genetic material — i.e. DNA. It’s easy to see why evolution came up with the idea of a separate enclosure for DNA which only has to do two things: reproduce itself and enable regions of its four base code to be transcribed into molecules that can cross the nuclear membrane to be translated into proteins in the body of the cell. But here’s the puzzle. The nucleus is very small and there’s an awful lot of DNA — over 3,000 million bases in each of the two strands of human DNA (and, of course, two complete sets of chromosomes go to make up the human genome) — so 2 metres of it in every cell. A rather pointless exercise, unless you go in for pub quizzes, is to work out the length of all your DNA if you put it together in a single string. 1013 cells (i.e. 1 followed by 13 zeros) in your body: 2 metres per cell. Answer: your DNA would stretch to the sun and back 67 times. Mmm. More relevantly, the nucleus of a cell is typically about 6 micrometres (µm) in diameter — that’s six millionths of a metre (6/1,000,000 metre), into which our 2 metres must squeeze. Time for some serious packing to be done but it’s not just a matter of stuffing it in any old how and sitting on the lid. As we’ve just noted, every time cells divide all the DNA has to be replicated and regions (i.e. genes) are continually being “read” to make proteins. So the machinery in the nucleus has to be able to get at specific regions of DNA and disentangle them sufficiently for code reading. Part of evolution’s solution to these problems has been to add proteins called histones to DNA (the term chromosome refers to DNA together with histone packaging proteins and other proteins). To understand how this leads to “more being less”, consider DNA as a length of cotton. If you just scrunch the cotton up into a ball you get a tangled mess. But if you use cotton reels (aka histones — two or three hundred million per cell), you can reduce the great length to smaller, more organized blocks — which is just as well because they’re all that stands between life and a tangled mess. Thinking of histones as cotton reels helps a bit in thinking about how the nucleus achieves the seemingly impossible but the fact of the matter is that we have no real idea about how DNA is unravelling is controlled so that the two strands can be unzipped and replicated, yet alone the way in which starting points for reading genes are found by proteins. Undeterred by our profound ignorance Haifeng Wang and colleagues at Stanford University have just done something really amazing. They came up with a way of moving regions of DNA from the jumble of the nuclear interior to the membrane and they showed that this can change the activity of genes. They used CRISPR (that we described in Re-writing the Manual of Life) to insert a short piece of DNA next to a chosen gene. The insert was tagged with a protein designed to attach to a hormone that also binds to a protein (called emerin) that sits in the nuclear membrane. So the idea was that when the hormone is added to cells it can hook on to the DNA tag and, by attaching to emerin, can drag the chosen gene to the membrane. The coupling agent is a plant hormone (abscisic acid) although it also occurs in other species, including humans. 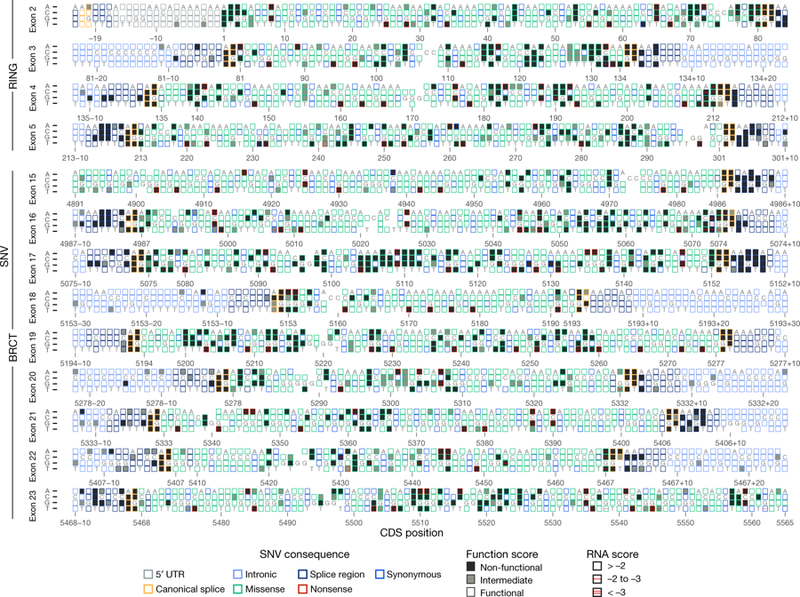 Wang & Co christened their method CRISPR-GO for CRISPR-Genome Organizer. Tagging a DNA insert with a protein so that a coupling molecule can pull a region of DNA to a protein in the membrane of the nucleus. From Wang et al., 2018. Repositioning regions of DNA in the nucleus. DNA is labeled blue which defines the shape of the nucleus. Red dots are specific genes before (left) and after (right) adding the coupling agent. From Pennisi 2018. Astonishingly well. Not only could it shift tagged DNA from the interior to the membrane of the nucleus but the rearrangements could change the way cells behaved. Depending on which regions were moved and where to, cells grew more slowly or more rapidly. So this is a really remarkable technical feat — but it’s not just molecular pyrotechnics for fun. It looks as though this approach may offer at long last a way of dissecting how cells go about getting a controlled response out of the mind-boggling complexity that is their genetic material. Wang, H. et al. (2018). 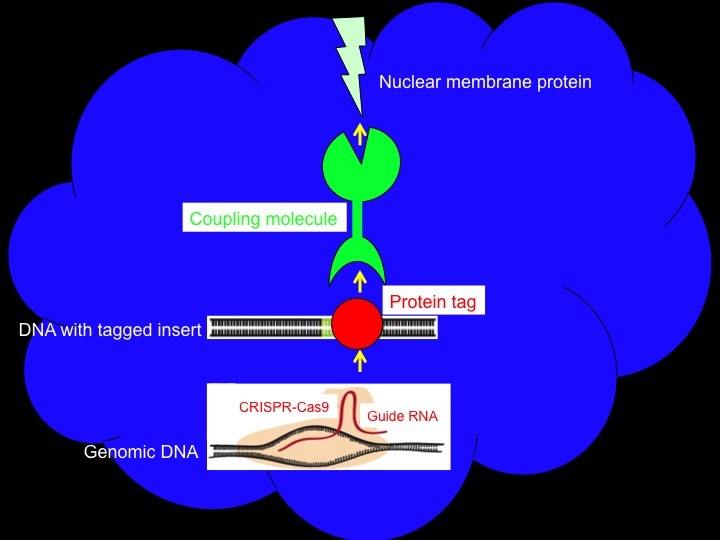 CRISPR-Mediated Programmable 3D Genome Positioning and Nuclear Organization. Cell 175, 1405-1417. Pennisi, E. (2018). Moving DNA to a different part of the nucleus can change how it works. Science Oct. 11th. The world changed in 1953 when Watson and Crick and their chums revealed the shape of the stuff of life. Our genetic material, DNA, was made up of pairs of long, intertwined chains of nucleic acids. Whether at the time we realised it, the publication of their little paper in Nature launched the age of molecular biology. Sketch of DNA made by Odile Crick, Francis Crick’s wife, for Watson and Crick’s 1953 paper. The two ribbons represent the phosphate sugar backbones and the horizontal rods the pairs of bases holding the chains together. The arrows show that the two chains run in opposite directions. From Watson and Crick, 1953. A couple of years later Francis Crick gave a remarkable talk to the RNA Tie Club in Cambridge in which he outlined how the structure of DNA offered mechanisms by which essentially all the fundamental processes of life might work. If the double helix was ‘unzipped’ each strand could provide a template for a new strand to be made with a complementary sequence of base units. Thus when cells divided two identical sets of double-stranded DNA were available, one for each new daughter cell. Pulling the two strands apart would also make them available to be copied into an intermediate (RNA) that could carry genetic information to the cellular machine that makes proteins (that we now know as a ribosome). Crick had the idea that a set of adapter molecules must exist that could pick up amino acids (the building blocks of proteins) and present them to this machine in a way that enabled the correct one out of the 20 or so in the cell to be joined to the growing protein, as specified by the DNA/RNA sequence of a gene. All this duly came to pass in a spectacular series of discoveries. The first, in 1958, was the experiment in which Matthew Meselson and Franklin Stahl showed that each of the two double-stranded DNA helices arising from DNA replication comprised one strand from the original helix and one newly synthesized — ‘semiconservative replication’. John Cairns, the British physician and molecular biologist, described this as “the most beautiful experiment in biology”, as vividly recorded by Horace Judson in his wonderful account of those days, The Eighth Day of Creation. In 1961 Sydney Brenner, François Jacob and Matthew Meselson discovered messenger RNA, the intermediate nucleic acid that carries the code of genes to the ribosome. In the same year Crick, Brenner, Leslie Barnett and R.J.Watts-Tobin showed that the genetic code uses a ‘codon’ of three nucleotide bases that corresponds to an amino acid. Marshall Nirenberg and Heinrich Matthaei deciphered the first of the 64 triplet codons and Har Gobind Khorana, Robert Holley and Marshall Nirenberg shared the 1968 Nobel Prize in Physiology or Medicine for determining the complete genetic code by which every amino acid is encoded by three base sequences of RNA. Protein synthesis by ribosomes. Ribosomes are made up of two complexes (a large and a small subunit) of over 50 proteins and RNAs. They are present in all living cells. In the process of protein synthesis (translation) ribosomes link amino acids together in the order specified by messenger RNA (mRNA). The link is a peptide bond, hence the process is called peptide synthesis. 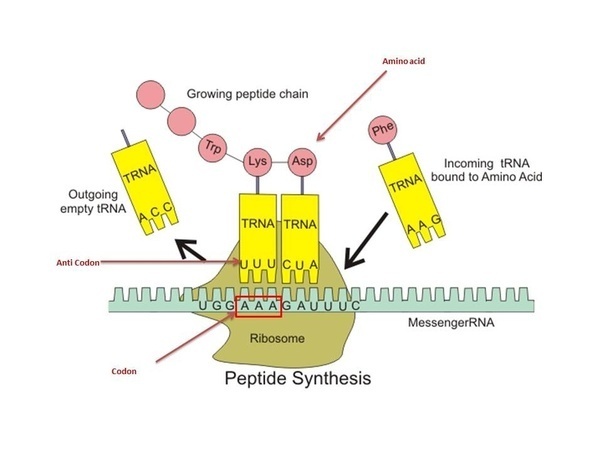 Ribosomes move along mRNA molecules sequentially, capturing transfer RNAs carrying the appropriate amino acids to be matched by base-pairing through the anti-codons of the tRNA with successive triplet codons in mRNA. As amino acids are linked together the protein chain grows and the tRNAs, no longer carrying amino acids, are released. The largest protein (titin — it folds up like a molecular spring to give elasticity to muscle) has over 30,000 amino acids. Very short proteins are usually called peptides (e.g., insulin with 51 amino acids, oxytocin with 9 amino acids). Thus were revealed the pieces of molecular lego upon which all life depends. It had all occurred in an extraordinarily short space of time after the resolution of the structure of DNA. The story goes that when Watson and Crick finally convinced themselves that they had worked out DNA they retired to The Eagle pub for lunch where Crick announced to the startled clientele that they had just discovered the Secret of Life! Francis Crick, notoriously, is not remembered for either his reticence or modesty and his outburst must have been met with shaking heads and shrugged shoulders from the assembled lunchers. However, with the benefit of hindsight, it’s hard to argue with his assessment. It’s taken a while but in the 1970s genetic engineering came into existence as a way of changing the genetic make-up of cells — knocking out genes or introducing new genes. Over the last ten years or so this has progressed to using modified viruses to boost the immune response in patients with blood cancers and to treat other diseases. This period has also seen the emergence of genome (or gene) editing that, in contrast to genetic engineering, makes specific changes to the DNA of a cell. This uses ‘molecular scissors’ to cut DNA at a known sequence. When the cut is repaired by the cell a change or ‘edit’ is made to the sequence. The best-known method is CRISPR (Clustered Regularly Interspaced Short Palindromic Repeats) or CRISPR/Cas9, Cas9 referring to the enzymes that do the cutting. We summarized how CRISPR works in Re-writing the Manual of Life but it’s worth reminding ourselves that this method is yet another example of using what nature provides. It’s based on the way bacteria build their antiviral defense system by incorporating sequences of DNA fragments from previous viral infections that are used to detect and destroy DNA from similar viruses during subsequent infections. Until now gene editing has mainly been used to make single changes at one or a few points in genomic DNA. Gregory Findlay, Lea Starita, Jay Shendure and colleagues at the University of Washington in Seattle have just changed all that by, in effect, making all possible variants in the BRCA1 gene and seeing what each did to the activity of the BRCA1 protein. The object of their attentions is a very big gene that encodes a very big protein: it has 1884 amino acids (so that’s 3 x 1884 = 5652 coding bases). Why did they pick such a tough nut for their tour de force? The BRCA1 (breast cancer 1) protein is essential for one of the processes by which cells can repair damaged DNA. If this protein doesn’t work properly mutations may accumulate and lead to cancer, making BRCA1 a ‘tumour suppressor’. As we explained in A Taxing Inheritance, women with a faulty BRCA1 gene have a 60 – 90% lifetime risk of breast cancer and a 40 – 60% risk of ovarian cancer (compared to 12% and 1.5% in the general population, respectively), facts that have been publicized by the actress Angelina Jolie. BRCA1 has been sequenced in millions of women and a huge number of variants in the DNA sequence have been found. As more is learned about BRCA1, ways of targeting cells with mutant forms are being developed (e.g. by an effect called synthetic lethality). But these advances highlight the problem that we simply don’t know what, if anything, most of the sequence variants do. They’re delicately called ‘variants of uncertain significance’ — science-speak for ‘we haven’t a clue.’ And until we do have a clue there are no grounds on which to decide whether a particular mutant might turn out to be harmful. To be accurate Findlay et al. didn’t quite ‘do’ all the possible variants — they just covered the regions known to be important in the actions of the protein. Even so, in applying ‘saturation genome editing’ to these key regions of BRCA1, they were able to test the effects on BRCA1 activity of 3,893 single nucleotide variants (SNVs). Mind blowing. Don’t try to read the detail but this extraordinary picture represents the critical regions of BRCA1. The letters are the sequence of bases (A, C, G & T) of the normal BRCA1 gene, the vertical columns of four boxes representing the possible variants at each position. In the work by Findlay et al. every possible variant was made — almost 4,000 — and tested for activity. From Findlay et al. 2018. The test vehicle for this ‘shot-gun’ approach was a cell line grown in culture that can only survive if BRCA1 is working normally. The cells were infected with small circular DNA carrying CRISPR and Cas9 sequences together with a library of edited BRCA1 exon sequences (exons are the bits of gene sequence that appear in mature RNA after non-coding bits, introns, have been removed). The result was that mutant exons were inserted in many of the cells. The cells were grown for 11 days during which time some of the cells died and some survived. 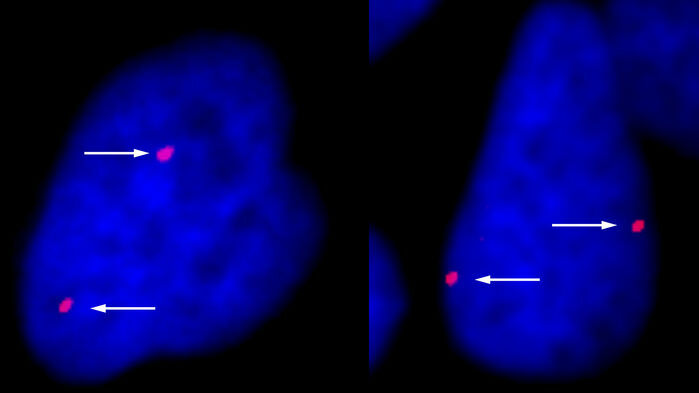 Deep sequencing of DNA extracted from the cells confirmed which BRCA1 mutations caused cell death. The idea behind ‘deep sequencing.’ The term simply means sequencing the same region many times so that DNA present in small amounts (e.g., in just a few cells in the sample) is detected. From the nearly 4,000 SNVs tested by Findlay et al. just over 400 were missense mutations i.e. the change of a single base (nucleotide) changed an amino acid in the protein so that BRCA1 was disabled. 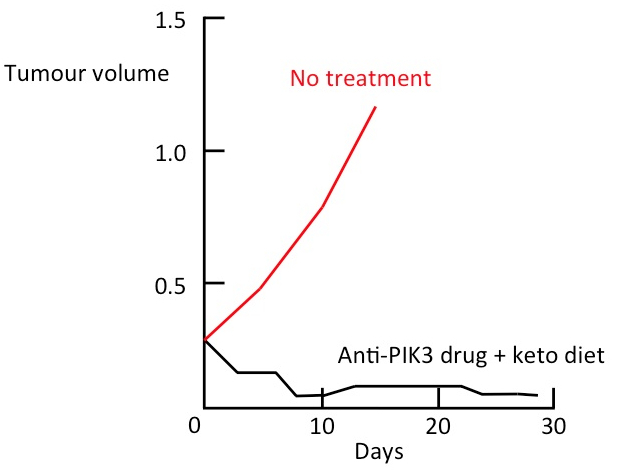 A further 300 SNVs reduced protein expression. Critically, Findlay et al. identified variants already known to block BRCA1 activity, thereby confirming the accuracy of their method. It is probable that more sophisticated models will be used in the future but it seems that these results will be immediately helpful in screening BRCA1 variants detected in breast tissue so that a rational decision can be made as to whether a given SNV represents a cancer risk or whether it is harmless. One might wonder whether, now that molecular biology has reached a stage where artificial proteins can be made in the lab, its practitioners may feel they have acquired almighty power — become human manifestations of a supernatural creator of the kind Richard Dawkins demolished in the The God Delusion. “No chance” I would say, in my cheerfully self-appointed role as spokesman for the community, happily aligning myself with Dawkins’ view that belief in a personal god is merely self-delusion. The experiments tinkering with BRCA1 are quite astonishing but, I’m sure Gregory Findlay and his friends would readily admit, they’re merely using the methods now available to ask important questions. In thinking about how natural selection works Dawkins came up with the analogy of a blind watchmaker. You might argue that twenty-first century biologists are molecular watchmakers with 20-20 vision, able to produce bespoke proteins. No supernatural forces are needed, merely the knowledge and skill to be able to tweak nature’s own machinery. Watson, J.D. and Crick, F.H.C. (1953). Molecular structure of nucleic acids: A structure for deoxyribose nucleic acid. Nature 171, 737-738. Findlay, G.M. et al. (2018). Accurate classification of BRCA1 variants with saturation genome editing. Nature 562, 217–222. H.F. Judson (1996). The Eighth Day of Creation: Makers of the Revolution in Biology. Cold Spring Harbor Laboratory Press, Plainview. Crick, F. (1955). A Note for the RNA Tie Club (Speech). Cambridge, England. Archived from the original (PDF) on 1 October 2008. Meselson, M and Stahl, F.W. (1958). The replication of DNA in Escherichia coli. Proceedings of the National Academy of Sciences of the United States of America. 44, 671–82. Brenner, S., Jacob, F. and Meselson, M. (1961). 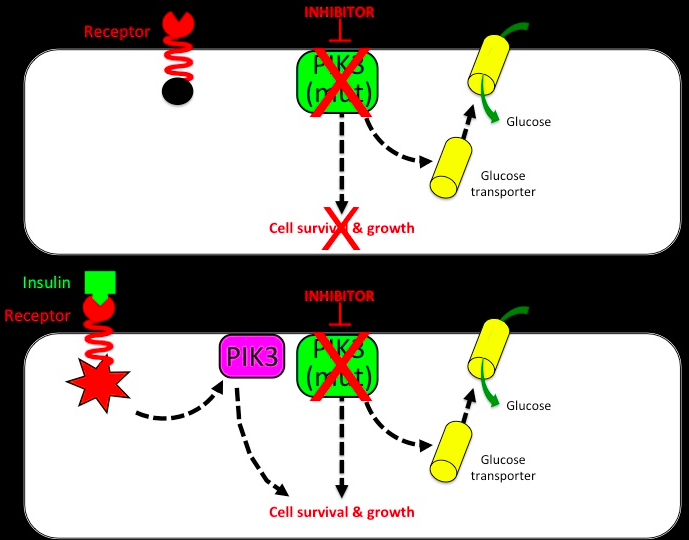 An unstable intermediate carrying information from genes to ribosomes for protein synthesis. Nature 190, 576-581. Cancer is a unique paradox. At one level it’s as easy as can be to describe: damage to DNA (aka mutations) drives cells to behave abnormally — to make more of themselves when they shouldn’t. But we all know that cancer’s fiendishly complicated — at least at the level of fine detail. Over the last decade or so the avalanche of sequenced DNA has revealed that every cell in a tumour is different: compare one cell to its neighbour and you’ll find variations in the individual units (the bases A, C, G & T) that make up the chains of DNA. It’s a nightmare: every cancer is different so we need an infinite number of treatments to control or cure each one. Time to give up and retire to the pub. Not quite. DNA sequencing has also revealed that, amongst all the genetic mayhem, some mutations are more important than others. The movers and shakers have been dubbed ‘drivers’: those that come along for the ride are ‘passengers’. The hangers-on are heavily in the majority but, even so, several hundred drivers (i.e. mutated genes that give rise to abnormal proteins) have been identified. As it needs a group of drivers to work together to make a cancer we still have the problem that the number of critical combinations that can arise is essentially infinite. One way of reducing the scale of the problem has been to look at what ‘driver’ proteins do in cells and to target those acting at key points to push cell proliferation beyond the normal. Just recently Giulio Caravagna, Andrea Sottoriva and colleagues at the Institute of Cancer Research, London and the University of Edinburgh have come up with a different approach. The idea goes back to the 1950s when a clever chap from Kansas by the name of Arthur Samuel came up with a program for IBM’s first commercial computer so that it could play draughts (checkers as our American friends call it) in its spare time. The program defined the patterns that could be formed by the pieces on the chequerboard so that, given enough of these, IBM 701 could indicate the optimal moves. Samuel called this machine learning, a precursor of the idea of artificial intelligence. Perhaps the most famous moment in this saga came in 1997 when a later IBM computer, Deep Blue, beat the then world chess champion Garry Kasparov. Unsurprisingly, Kasparov was a bit miffed and accused IBM of cheating — to wit, getting a human to tell the machine what to do. Let’s hope that in the end he came to terms with the fact that Deep Blue could crank through 200 million positions per second and, however many games Grandmasters have in their heads, they can’t compete with that. The cancer team realized that the mutations driving the evolution of cancer cells emerge as patterns in the sequence of DNA as a cell moves towards becoming independent of normal controls. Think of each cancer as a family tree of mutations, the key question being which branch leads to the most potent combination. To pick out these patterns they applied a machine-learning approach known as transfer learning to the DNA sequences from a large number of cancers. They called this ‘repeated evolution in cancer’ — REVOLVER — aimed at picking out mutation patterns at the heart of cancer that foreshadow future genetic changes and can be used to predict how they will evolve. Identifying patterns of mutation common to different tumours. Samples are taken from different regions of a patient’s tumour (represented by the coloured dots). Their DNA sequences will have multiple variations that can mask underlying patterns of driver mutations present in some subgroups. The five trees show mutations picked up in those patients. REVOLVER uses transfer learning to screen the sequence data from many patients and pull out evolutionary trajectories shared by subgroups. The dotted red lines highlight common patterns that are represented in the lower strip. From Caravagna et al. 2018. REVOLVER was applied to sequences from lung, breast, kidney and bowel cancers but there’s no reason it shouldn’t work with other tumours. The big attraction is that if these mini-sequence mutation patterns can be associated generally with how a given tumour develops they should help to inform treatment options and predict survival. We have in the past referred to the ways cancers evolve as ‘genetic roulette’ — so perhaps it’s appropriate if game-playing computer programs turn out to be useful in teasing out behavioural clues. Caravagna, G. et al. (2018). 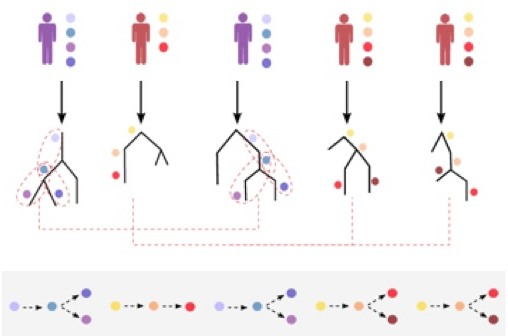 Detecting repeated cancer evolution from multi-region tumor sequencing data. Nature Methods 15, 707–714.